Approximately 40% of Americans suffer from chronic shoulder pain. It showed that a great majority of shoulder pain can arise from a lack of muscle tone or imbalance in one or both shoulders. Thankfully, most shoulder pain, arising from weak shoulders, can be resolved through a regular shoulder exercise routine, or shoulder workouts. Performing shoulder stretches before you exercise can also help alleviate pain. Exercising the shoulder area is also important in preventing injuries to the joint and muscles from overuse. You are less likely to suffer from overuse injuries, such as problems with your rotator cuff, when you have strong shoulders that are used to handling heavier objects. Shoulder workouts can also help you build muscle endurance, meaning your shoulders will not get fatigued quite as quickly during strenuous activities or lifting heavy objects. One great aspect about starting a shoulder workout program is that you can tailor the exercises to your own preference, allowing you to make the routine as hard, or easy, as you want. If your shoulder is already injured, you can still exercise and build strength to help ease your shoulder pain. There are a host of various shoulder modifications that will help you build strength in your shoulders without agitating the injury. Without further ado, here are 20 of the best shoulder workouts that can help you build muscle mass and strength to prevent injury and ease existing shoulder pain. The following list is comprised of 15 shoulder exercises that should be performed with dumbbells, kettle bell, or weighted ball. The amount of reps you should complete of each exercise is dependent on whether you want to build muscle strength (and become bulkier) or muscle endurance (lean muscle tone). Usually, a good rule of thumb for any exercise is to perform 6-8 reps with a heavier weight if you want to build muscle mass. If you want to build lean muscle without getting bulky, set a goal of completing 8-12 reps with a lighter weight. 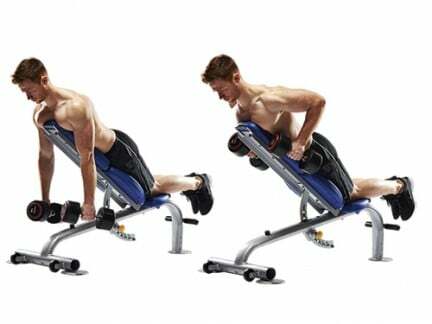 The seated dumbbell press is one of the more traditional shoulder exercises to build muscle mass. 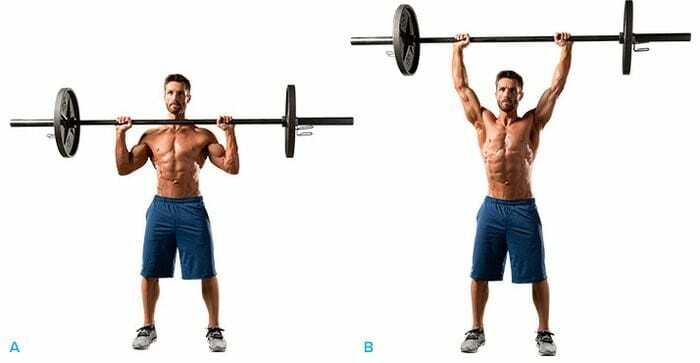 To perform this exercise, take two dumbbells and rest them above your shoulders, using your shoulders, push the dumbbells up until your arms are fully extended. Maintain full extension for 1 second, then raise them back down to starting position. This counts as 1 rep. 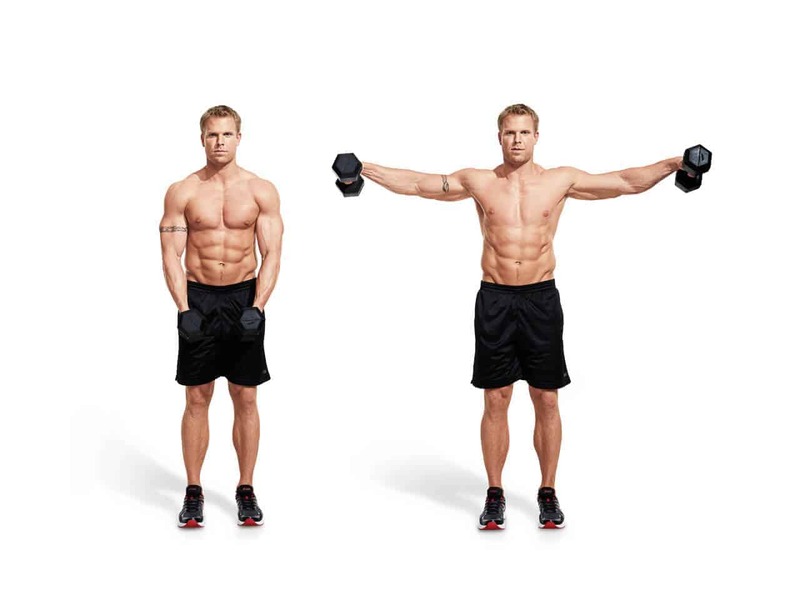 This exercise is a variation of the standard lateral raise. The proper starting position is to be bent over at the waist, keeping your chest up, back flat, and knees slightly bent. Make sure the dumbbells hang directly beneath your elbows, which are also slightly bent. Keeping your back flat and chest up, slowly raise the dumbbells up and out until they are parallel to the floor. Pause at full extension for a second, then lower the dumbbells back into their starting position. The barbell overhead press should be performed with a barbell if possible. If you do not have a barbell, you can modify this exercise to use dumbbells or a kettle bell if needed. Start out with the barbell in front of your shoulders and parallel to the floor. Keeping your core engaged and shoulders flexed, raise the barbell straight over your head, hold it above your head for a second, then slowly bring it back down to the starting position. 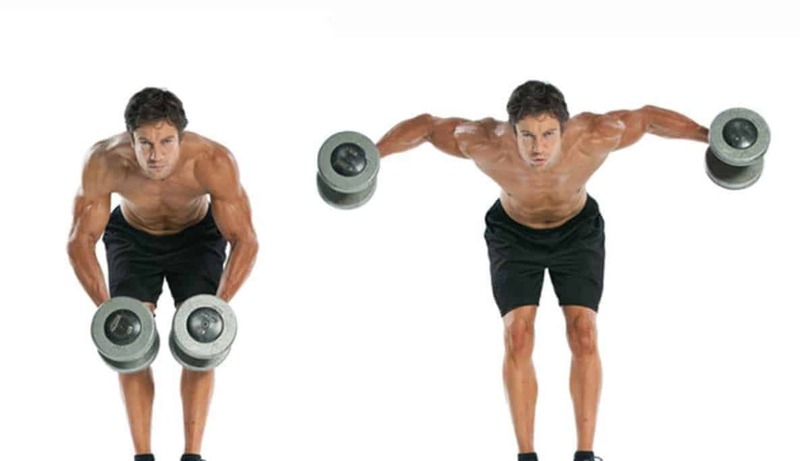 A standing dumbbell fly is a great exercise to build your shoulder muscles. Starting with your feet shoulder width apart and arms fully extended at your sides with two dumbbells, flex your upper arms and shoulders to raise your arms until they are parallel with your hips. Make sure to use slow and controlled movements to bring the dumbbells back to starting position. This great shoulder exercise utilizes a cable machine to exercise your back and shoulder muscles. To perform this exercise, you should place the cable at a height slightly taller than your body. You want the cable to be in line with your nose when you apply tension to the machine. When the cable is set at the appropriate level and weight, engage your core to keep stability as you use your shoulders and back to pull the rope towards your face. 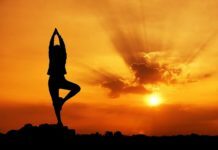 The end position will be in front of your nose, with your arms bent and stretched outward. The high pull exercise is a variation of the traditional row, but with a barbell instead of a cable machine or dumbbells. 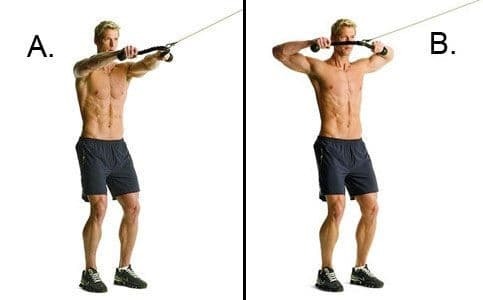 Hold the bar parallel to the ground, with your arms fully extended and in line with your shoulders. Raise your arms straight up, keeping your elbows in line with your shoulders. Pause at this position for about a second and use controlled movements to lower the bar back down to starting position. 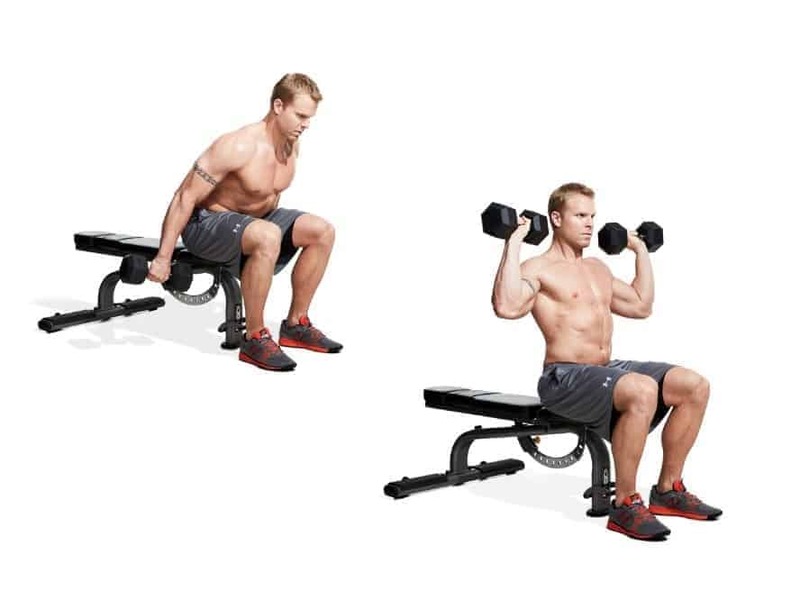 The seated dumbbell clean is a slightly easier modification of a clean by sitting on a bench. To perform a seated dumbbell clean, you need a bench and two dumbbells. Sit on the edge of the bench with two dumbbells, making sure your back is flat and chest is up, and lean forward. From here, straighten your body explosively and allow the momentum to bring your arms forward and your wrists to flip over. Catch the weights at shoulder level and hold for a second, then lower back into starting position. Another exercise that utilizes dumbbells to add resistance, the trap raise can help build shoulder strength through shoulder stretches. Start the exercise by setting a bench to a low incline; lie chest down on the bench with a dumbbell in each hand and your palms facing each other. From here, raise the weights straight out and parallel to the floor. Using controlled movements, return the dumbbells back to their starting position. The clean and press is the bread and butter for both cross-fitters and exercisers. The clean and press exercise can be daunting for first timers, but you will be surprised at how simple this exercise can be after you get used to explosive movements with weights. To do a proper clean and press, you should be standing with your feet shoulder width apart and your lower back arched, in front of a barbell. Grasp the bar with your hands shoulder width apart. Engage your hips to lift the bar off the floor. When the bar reaches your knees, jump and use the momentum created to flip your wrists and catch the bar at your shoulders. Engage your abs, stand tall, and press the bar straight overhead. 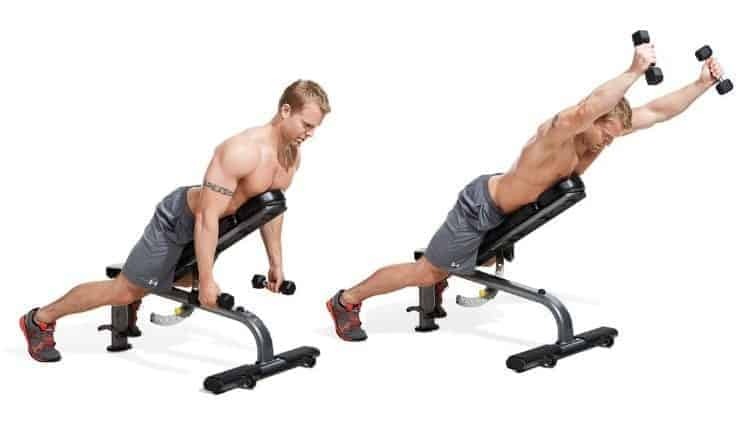 The dumbbell incline row also uses a bench for support. Keep the bench at a high incline and lean into it with your arms fully extended and dumbbells in hand. Roll the dumbbells into your side by flexing your elbows and shoulder blades. Return to starting position. The dumbbell lateral raise has the same process as a regular lateral raise with the bar. Start with arms extended and legs shoulder width apart, raise your arms outward until they are fully outstretched and level with your shoulders. Return to starting position. The Arnold press is a relatively unknown shoulder workout that can be difficult to perform correctly. Start with your feet hip width apart, with a slight bend in your knees. With two dumbbells in hand, keep your arms close to your body and palms facing towards your face. 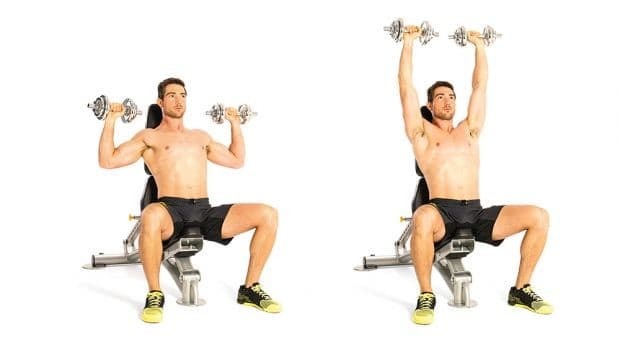 With controlled movements, bring the dumbbells up and around until you are in a standard shoulder press position. From there, raise your arms straight up into a full extension. 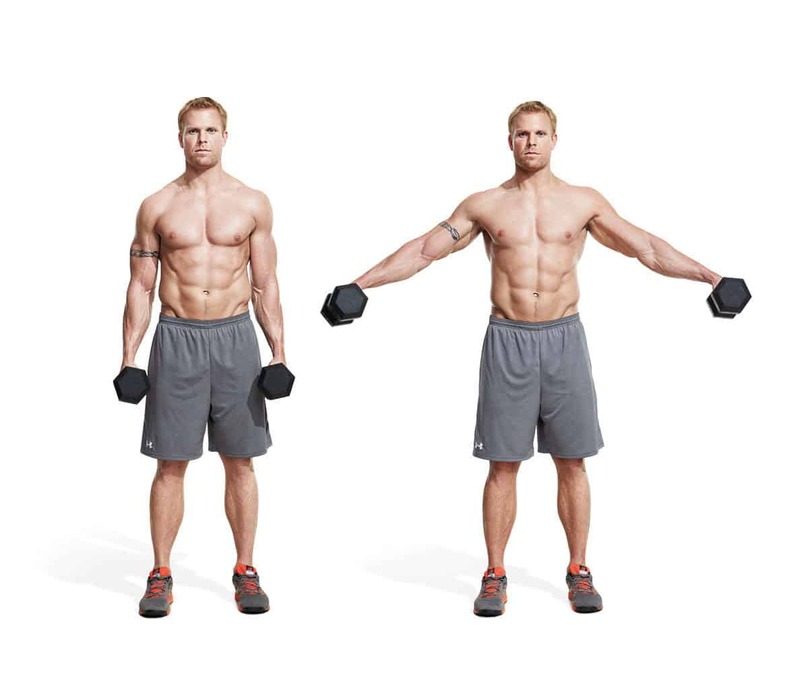 Hold this for one second, then return the dumbbells back to their starting position. The palms-in shoulder press is a slight variation of the regular shoulder press. It has the same mechanics and is performed the same way, except your palms are facing towards your body, instead of facing outward. The front raise is a very easy, yet effective, exercise to build your shoulder strength. Get into a lateral raise position, but keep the dumbbells in front of your hips, instead of to the side. Raise your arms perpendicular to the ground and directly in front of your body. Lower them back to their starting position to complete the rep. The one arm cable lateral raise utilizes a cable machine to focus on one arm at a time for a lateral raise. Keep your legs shoulder width apart and hold the cable bar in the hand farthest away from the machine, in front of your hips. Raise your arm straight up and to the side until your wrist is at face height. Use controlled movements to return your arm to the starting position. These 5 shoulder exercises are to be done without weights but don’t be fooled, body weight exercises can be just as challenging as weighted exercises. 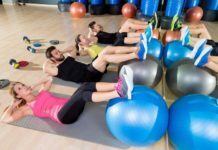 Four of these exercises are variations of the standard push-up that are designed to hit various shoulder muscles and target groups, the fifth exercise is a variation of a plank. Similarly, to the weighted shoulder exercises, you want to perform 6-8 reps of each exercise if you are wanting to build strength; 8-12 reps of each exercise if you want to build endurance. Make sure to perform all reps with good form to get the most out of each workout. 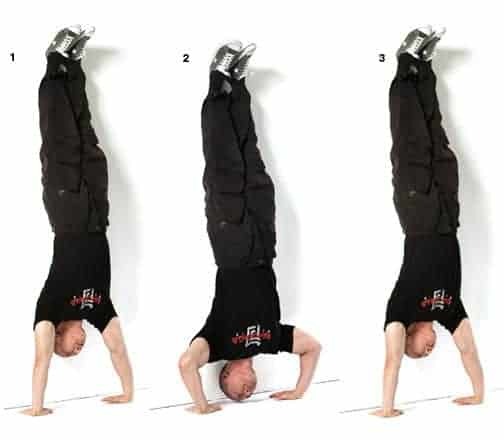 The handstand push up, also known as a vertical push-up, is an extremely challenging, expert push-up variation that is performed upside down, in a handstand. For beginners and intermediate exercisers, or for those who don’t feel comfortable doing this exercise, you can modify the workout by using a wall for support. The pike push-up is often used as a transition push-up to help build up strength and confidence before going into a full handstand push-up. Despite being supported with your legs on the ground, your upper body will still be upside down and getting acclimated to performing push-ups upside down. While the pike push-up is easier to execute than the handstand push-up, it should not be taken lightly, pike push-ups can really work your shoulders to exhaustion. When doing this exercise, make sure to keep your head in line with your shoulders as you press down into the push-up, otherwise you risk injuring yourself or, not working out the correct areas. Another advanced push-up variation, the bridge push-up is not to be taken lightly. To perform this exercise, you must first get into a bridge position. Once you are comfortable and settled into a bridge, you perform a push-up, making sure to push down through your palms and keeping your head in line with your shoulders. If you find the normal bridge push-up too easy, you can rest your hands on yoga blocks, giving you a deeper push-up. Get on all fours on the ground with your feet hip-width apart and your hands shoulder-width apart. The starting position of this exercise resembles the starting position of a pike push up. Slowly begin lowering your upper body, keeping your feet and hands planted firmly on the ground. Continue lowering your body and begin to move your head through your shoulders. Pretend you are crawling under a fence for reference. Once your body is straight and parallel to the ground, push up with your upper arms and shoulders into an upward dog position. This process constitutes as 1 rep. Taking a break from push up variations, the next shoulder workout is a simple plank with shoulder taps added in. To do this exercise, start in a normal plank position, keeping your back straight and hips parallel to the ground. Engage your core and tap your shoulder with the opposite hand. Repeat the shoulder tap on the other side. This is one rep. There you have it, 20 great shoulder exercises that can help alleviate shoulder pain and build strength. Don’t forget to warm up with some shoulder stretches before you start any shoulder workout.